The Odyssey Woodshop sources all of our hardwood slabs locally in the beautiful mountain town of Asheville, North Carolina. By placing a hand on every piece of wood before we bring it back to the Woodshop, we are assured of not only it's beauty and strength, but the life it still has to share as well. We work with Black Walnut, Cherry, Osage Orange and Maple. These woods will stand up to years of use by your finest knifes and will age with depth and grace. 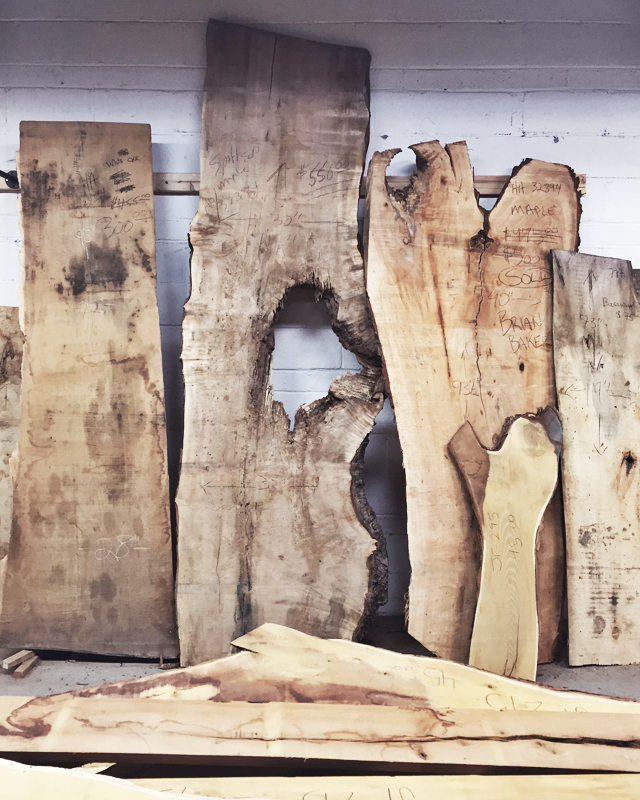 But we love a challenge... have a specific type of wood in mind for a special slab project? Shoot us an email, we'd love to hear from you. No two slabs are ever the same. And no two of our boards will ever be either. We love this about working with hardwoods. There is something about working one-of-a-kind that speaks to our soul... and truly - it honors the tree in a way mass produced or plank cutting boards do not. We allow the natural grains and knots to guide our design process. And we love details. Some boards feature live edges, some we burn a bit to highlight certain aspects of the design. Every board is branded with our infinity mark... because as your board will tell you... it lives on. You can absolutely cut meat and cheeses on a wooden board. Independent research by University California-Davis Food Safety Laboratory showed no difference in long term contamination between plastic and wooden boards. ALWAYS hand wash with hot water after every use; thoroughly wipe with a clean dishcloth and prop up to dry completely. A mixture of sea salt (or baking soda) and lemon work well to scrub out deeper marks and stains. Several applications may be required for deeper stains or water marks. Do not place your board in the dishwasher. Knife marks will occur with use of your board. If knife marks become deep, they will smooth with a light sanding with fine-grade sandpaper. Oil your board once a month. We use a natural, flavorless and hypoallergenic oil on all of our finished slabs. Most common oils to maintain your board include flaxseed oil, mineral oil and walnut oil (though steer clear of the latter with nut allergies). Simply saturate a clean piece of cloth with your chosen oil and rub into the board, coating the entire surface evenly and then wipe excess oil away. Allow to dry overnight. We love family. We believe that gathering around the dinner table at night is sacred. It's time to reclaim the tradition of family meal time. Family can be your partner, your children or simply your community. However you define it - take it back. Come together and sit - linger over your plate... talk and laugh until the candles burn out. We want to create an heirloom table for you to enjoy such moments. Our process is collaborative and open - we help you select the perfect slab or boards and provide guidance on the ideal building blocks of your new dining room table. Then we handcraft every element. Interested in collaborating? Email us here.